We see an interesting log framed gate off Highway 101 while touring Olympic National Park. This must be the famed Timber Town, we’ve been hearing about. We turn in, buy a ticket, and take our change in Timber Town wooden nickels. After parking our car in the parking lot at the front of the 57 acre site, we walk toward a white picket fence on the west end of the lot. At the start of Main Street, we find that the boardwalk splits and runs down both sides of the whole length of the street. Since its early in the morning, we decide to stop in at the Cookhouse to have a real old fashioned logger breakfast. The Cookhouse is designed to look just like a 1900 ear logging camp mess hall. Long unfinished wood tables are set up family style. Metal plates are placed along each side along with utensils and coffee mugs for each person. Hot cakes and bacon are served on a platter which is passed down the line until they are gone. Don’t worry, more are coming up right away. Coffee, syrup and butter are already on the table, along with milk for the kids. When we are finished, we take our dirty dishes to the kitchen and head next door to the Orientation Building. This building is one large room with walls lined with historical pictures of logging activities. To entertain youngsters, there are a number of various size rocking horses made out of logs, with real leather saddles. At the far end is a stage where a guide spends about 15 minutes every half hour giving everyone an explanation of what we will be seeing as we take a train trip through history. To start with, our “train” will only be an open tractor pulling a string of open carts along a trail which will eventually have tracks and a real logging train. Later on as attendance justifies, that actual train and tracks will be installed. Our first stop is right in the middle of a 1900 era logging camp. Why right in the middle? Its very simple. Railroads were the key to getting logs to sawmills in those days. Loggers actually built the tracks for trains as they logged. So tracks ran right through the middle of their camps. We will see a typical scene in a logging camp with an antique locomotive and flatcar being loaded with logs. In this camp we find a group of very primitive, skid mounted bunkhouses. Each house contains a pot belly stove in the center. Wood framed cots line the sides. Kerosene lanterns provide the only lighting. Other buildings in the camp include a cookhouse where meals are prepared and eaten. Another shack is set up to do laundry with tubs and washboards. A clothesline stretching outside contains a large pair of red, long underwear, a large flannel, red and black, plaid shirt, a pair of wool socks for boots and a pair of large overalls. Last but not least, we see an outhouse. All of these buildings are skid mounted so that they can be easily moved as logging progresses. During this period, most trees were old growth giants, hundreds of years old. To show what these giants looked like, Timber Town has built a simulated old growth forest. Felling trees was accomplished by cutting a large notch with axes and then using a bucksaw from the opposite side. To get up to the right height to make the cut, fellers had to drive springboards into the trees, which they stood on to do their work. We see a couple of automated fellers, standing on a springboard, hard at work the their bucksaw. But before the first tree was felled, a highclimber climbed up the tallest tree in the vicinity, cutting off all its branches with a small handsaw and attaching a pulley mechanism at the top to create a spar tree. This is used to drag logs up to the rail side, then lift logs up onto rail cars, using a steam donkey. We see automated loggers engaged in various stages of this activity. We also see smaller logs placed end to end to create a trough to skid logs on up to the rail side. These are known as skid roads. We see logs being dragged along these either using steam donkeys or with a team of full scale replica horses or oxen. All the branches being cut off from the timber is piled onto large brush piles to be burned when causing a forest fire is unlikely. Moving on down the line on our train, we come to a sawmill typical of this period. It is basically a series of bucksaws mechanically rocking up and down as a log is pushed through them. Going on to the next stage of logging history. By the 1950s there were many roads built through our forests and most people had some kind of personal vehicle. Rugged pickup trucks and Jeeps, leftover from World War II, became the favorites for loggers working out in the woods. We see such vehicles parked along the road. They no longer had to live where they were working. Now, instead of building railroads, they were building roads as they extended their logging activities further into the forests. Heavy duty trucks were being built capable of hauling a load of logs over rough logging roads, out onto main highways, and on into sawmills in main cities. Loggers could use these same roads to get back and forth to work. The advent of chain saws at this time revolutionized the logging industry. Instead of using small handsaws to delimb a tree, we see animated highclimbers merely using small chainsaws to cut off all the branches. Instead of using axes to cut notches into trees, animated fellers are simply using their chainsaws. Extra long chainsaws were developed to make the main cut through the heart of the tree. We see animated loggers illustrating all these techniques. Dragging logs back to where they can be loaded onto trucks still utilizes a spar tree. But now we see the donkey engines are now powered by diesel or gas, instead of steam boilers. Heavy duty tractors have replaced horses or oxen in those places where the spar tree can’t be utilized. During this period, we see that clear cutting has left entire hillsides an ugly mess of brush and stumps, with no thought of helping nature to restore the forest. We see a scale model of such a clear cut, pointing out the problems of the system. As we enter the present stage of logging, we see another scale model showing that clear cutting has been modified to follow natural terrain, leaving buffer strips along streams so debris can’t get into the waterways as easily. We see animated workers replanting seedlings in logged off areas, shortly after logging operations have moved on. In another area, we see workers thinning a young forest to give the healthiest trees room to spread out and grow tall. Most surprising of all is the changes we see in logging operations. Chainsaws are still being used to delimb trees. But heavy duty wood chippers quickly reduce sprawling branches into chips and needles, which makes a good cover for the forest floor. Most impressive of all, we see a huge machine which clamps hold of a tree trunk, quickly cuts off the tree below where it is being held, and then gently forks pick up the log and carries it over to load it on a logging truck. If the terrain is particularly difficult, modern loggers have one last tool to work with that early loggers could never have visualized – a big, heavy duty helicopter that hovers over a log while chokers are wrapped around it and then lifts it up in the air and moves it to a location where ground equipment can more conveniently handle it. Next we see a powerful bulldozer making short work of uprooting all the tree stumps left over from logging to make a more suitable floor for the new forest that will soon be planted here. Our journey through the present logging era won’t be complete until we have seen scale models of a modern sawmill, a modern paper mill, and a modern plywood manufacturing plant. Then we pass a tree farm where we pick up seedlings as they are prepared for replanting forests as a souvenir. Finally just before we return to the Orientation Building, where we started our trip, we stop to watch a small wood shingle mill in operation. Each shingle is stamped with a Timber Town label and given to each visitor as another souvenir. We get off where we started. Now we are ready to explore the rest of Timber Town on foot. Since we are already on the west side of the street, we will continue on up Main Street, first taking in the large building next door. This is one of the two large buildings where we will find a wide range of antique logging equipment on display. Guides dressed as loggers explain to visitors how each was used. Occasionally, there will be various types of musical groups performing in here some of the tunes familiar in the early 1900s. Do we know of any songs loggers themselves sang in their bunkhouses? There are plenty of sea shanty songs that sailors used to sing, there must be something similar loggers sang. They both lived similar types of lives. Now we are ready to enter the heart of Timber Town, the downtown portion of Main Street. This is a replica of what a typical town in logging country looked like about 1900. All store fronts are made of rough lumber with a porch roof extending out over the boardwalk. Since most transportation is by horse, horse and buggy, or horse drawn wagons, we notice hitching rails in front of each store. We even see full scale replicas of horses with buggies and wagons parked along the street. More surprising, we even find one or two horseless carriages parked in front of a store. Maybe a Stanley Steamer, or a merry Oldsmobile. Modern vehicles used by employees and suppliers are all parked out of sight behind the stores. Stores sell a variety of products available in that time period. First we see an old fashioned soda fountain, serving ice cream sodas of many flavors, sundaes, milk shakes, root beer, and even Sasparilla. It has a counter and stools as well as small tables with wire back chairs. Next we see an old fashioned saloon complete with swinging doors, a bar with foot rail and spittoons. Sorry, since all the visitors here will be going back on the highway when they leave, all drinks served are non-alcoholic. Card tables are spread around the room so you can play a few rounds of poker while a player piano cranks out some lively tunes. A general store stocks only that kind of merchandise available to customers in 1900. But even more restrictive, the store must cater to the needs of tourists. So we see a few grocery items, a few clothing items, a few books about logging, penny candy (sorry, it’ll probably cost you a dime), magazines, newspapers, postcards, toys, games, and anything else to keep the kids occupied on the rest of the trip. Other stores might be selling souvenirs, candles, pottery, decorations, or generally anything that can fit in a car. Last but not least, we come to the photographers studio. Here we can dress up in old fashioned clothes to have our picture taken or we can put our head into a comic scene. Or two can grab a bucksaw to have their picture taken sawing a log. Going on across the street, we come to the location where an expert chainsaw artist is practicing his trade, noisily creating a sculpture of something out of a log. The area is filled with dozens of very cute bears in various poses, along with numerous other animals, comic characters, and anything else the artist can visualize making out of a chunk of wood. A similar activity is going on in the next shop but is much quieter and the finished work is much more refined. It is a wood sculptor practicing his artistic trade with a hammer and chisel. While the chainsaw are lends itself to yard decorations, this sculptor work is definitely intended for interior decorating. Much of it is even sanded and coated with some form of varnish or lacquer to protect it. This shop is actually more typical of the rest of the wood shops. It has a large front window so visitors can watch the artist doing his work with a door at the side so those interested in buying a piece can step inside to a counter to make a purchase. Like all the retail shops across the street, the front of these buildings is rough wood with a slanted porch roof extending out over the boardwalk. Next we see a shop where sign maker is making very interesting wooden signs with names, sayings, cartoons, etc. routed into the wood. These are primarily intended for residential use. Next door we see another sign shop making much larger signs for commercial use. They are created by etching out the surrounding material from around the letters making them smooth raised letters against a rough finish background. Spray painting enhances the difference to make a very distinctive and modern appearing sign. At another shop we find a toymaker hard at work mass producing a variety of very attractive wooden toys – trucks, cars, trains, airplanes, etc. Kids will be spending a lot of time dreaming about using those toys. Still another is busy making a lot of cute souvenirs made of wood. Finally we have a ship where a wide variety of cute bird houses, bird feeders, and other wood knick knacks are being made. This completes the window shopping on Main Street leaving us with many ideas for buying or making wood items in the future. This building will again contain a variety of antique logging equipment. However, it will include a lot of collections of a wide variety of logging tools and wood working tools, showing the evolution of each from early years up to modern times. A collection of bucksaw blades features artwork painted on each blade. Again there are musicians wandering back and forth between the two Static Display Buildings. Getting near the end of our tour, we enter the gift shop. This will be a typical souvenir shop with a difference. It will feature items not only made mainly of wood but also items made from every kind of wood. Items will advertise Timber Town, promote the idea that timber is a replaceable crop, that we are not destroying our forests, that the timber industry is being a good steward of the environment, that it provides many good jobs, and its products are critical to the housing industry. Last but not least we come to the office and library. 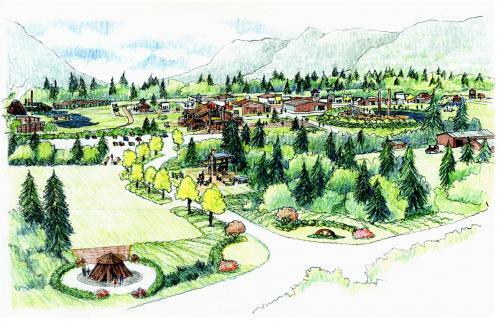 Timber Town will eventually become a major information center anything related to forests, forestry and the history and technology of logging, wood products, and wood processing. Books on all these subjects will be collected and be available to anyone needing such information. The office will be staffed by volunteers, who are retirees having experience and expertise in these fields. Not on the regular tour for visitors, this area is screened off from them. It includes a storage area for incoming antique equipment, which may be very rusty after being stored for many years out in the weather. As a result, this area may tend to look like a junk yard and is hidden behind a grove of large trees. Two large buildings are located next to this storage area where this equipment is disassembled, sandblasted, cracks are welded, bearings are replaced and greased, cables are replaced, badly deteriorated parts are replaced by parts in better condition from other antique equipment, and finally reassembled and repainted. The finished products are moved out to the appropriate locations in the rest of the town. Six smaller buildings nearby house shops for all the different crafts needed to perform all these activities. Volunteer mechanics, welders, machinists, sandblasters, blacksmiths, electricians, spray painters, etc. will be working in these shops as their expertise is needed to bring hundreds of pieces of equipment back to working condition again. We are free to wander around Timber Town as long as we like. There are hiking trails all over the area and many benches to rest on and enjoy the scenery. Kids will find playgrounds featuring large wood playthings to climb on, swing on, slide on, and teeter on. There are places to just sit and whittle awhile. Once in a while, Timber Town will host a logging show where experienced loggers will compete in a variety of activities. These include such things as bucksawing contests, pole climbing races, axe throwing contests, log rolling contests, and chainsaw contests.